Standard & Poor’s faces a classic Catch-22 in deciding whether to downgrade South Africa’s sovereign debt. All things being equal, S&P would use a Dec. 2 review to become the first of the three main ratings agencies to cut the emerging market nation’s foreign-currency debt to junk status. Yet it will be reluctant to take a step which could make things worse. S&P has some basis to act. South Africa’s GDP growth will be anaemic this year, pushing up net debt to GDP to almost 48 percent of GDP by 2019/20. Meaningful reforms to a domestic labour market stricken by unemployment exceeding 25 percent are thin on the ground. Worse, South Africa’s institutions are under fire. In recent months President Jacob Zuma has tried to block a report from the previous public protector into alleged improper dealings with the Gupta family of businessmen. Respected Finance Minister Pravin Gordhan has been on the receiving end of a failed prosecution attempt widely assumed to be politically motivated. A downgrade need not lead to a market panic. Local currency bonds in which most government debt are denominated would still be investment-grade, while JPMorgan’s Emerging Market Bond Index would not require asset managers to sell South African bonds even if they are labeled as junk. A hit to foreign-currency debt looks priced in – South African five-year credit default swaps already trade roughly in line with junk-rated states like Russia. The catch is that Zuma might use a downgrade to argue that South Africa needs a change of finance minister. The risk would be that the president then appoints a stooge who presides over a further increase in public support for state-owned enterprises like utility Eskom. That would undermine South Africa’s standing in the eyes of international investors who helped fund a current account deficit equivalent in 2015 to 4.3 percent of GDP. A big proportion of these funds are short-term flows from European banks, which are retrenching and could quickly turn tail. S&P doesn’t have to downgrade South Africa now – following its decision to put the state on negative outlook last December, it has another year to decide. Moody’s on Nov. 25 maintained its current rating. If S&P does likewise Gordhan would gain some breathing space. Credit rating firm Moody's kept South Africa's sovereign rating unchanged at Baa2 on Nov. 25, two levels above sub-investment grade, with a negative outlook. Also on Friday, Fitch kept the credit score of the country one notch above junk status but changed its outlook to negative from stable, warning that political risks could hurt growth. Standard & Poor's, which ranks South Africa one notch above junk with a negative outlook, is due to publish a review on Dec. 2. South Africa's ruling African National Congress (ANC) lashed out at debt rating agencies on Saturday, calling their references to political risk in recent reviews of the country mischievous and unscientific. 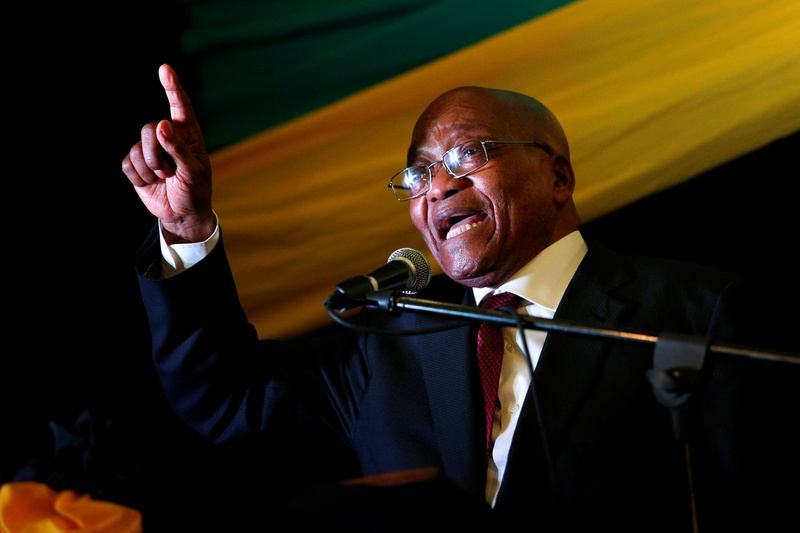 President Jacob Zuma faces a no-confidence vote on Monday by the ANC's National Executive Committee, with at least three of his cabinet ministers turning against him, Reuters reported on Nov. 28, citing local media. Public Protector Busisiwe Mkhwebane has laid a criminal charge against her predecessor, Thuli Madonsela, following a complaint from President Jacob Zuma, the South African Sunday Times reported on Nov. 27.